Last fall, it was an impulse buy from a club friend downsizing his bonsai collection; but has surprised me with it's tiny beauty. This is a dwarf Kazan and has produced flowers (1.5"/ 3.5cm) that actually seem iridescent in certain lights. Now I understand "it's all about the flowers" !! Has anyone grown this Satsuki and have any advice? Also does anyone know of any other dwarf varieties? Well, since you're in Minnesota I guess do whatever you have to do to keep an azalea alive through the winter! 'Kazan' and 'Chinzan' are the "dwarfs" you usually see as shohin or in rock/tray landscapes. There's really nothing tricky about it, it's just slow. Nice find! There are many varieties with small flowers. My personal favorite is 'Aozora'. But you can find varieties that are even smaller. 'Kakuo' is one of the smaller varieties but to me it looks more like a kurume than a satsuki (because it is a cross between a kurume and a satsuki). This may I saw a new variety 'Kosho'. That's a pureblood satsuki with flowers smaller than 'Aozora', almost as small as 'Kakuo'. All 'Kozan' family satsuki also have small flowers. But I think soon maybe a 'very small' category for 'Kakuo'/kiusianum sized flowers will be needed. I wonder how much of a market there is for these kinds of flashy satsuki as an impulse purchase among the general public. Thanks Russell, I can always expect knowledgeable information from you. 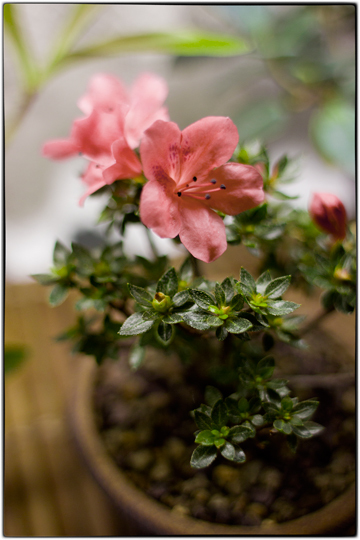 After growing several different kinds of azalea bonsai, this dwarf is a delight. The tiny bush probably will not make a show worthy bonsai but I love the tiny leaves and hope to start some wiring after blooms fade. Glaucus, The information you gave was very informative...with tight restriction on plant imports to the US and fewer American growers of Satsuki, we can only view the wonderful azalea your country offers. And.... you spoke of the general public and their impulse to buy satsuki; are you looking for a market or was there a reason to worry about the care of these wonderful plants? I am aware of the tight restrictions on imports in the US right now that were different in the past. Japanese satsuki growers that are certified can import very easily to the US. But normal garden plant azalea nurseries don't grow satsuki azalea like US nurseries do in areas where satsuki grow well. So actually there seem to be only amateur growers and professional importers here. Hobbyists can trade cuttings though. Unrooted and no soil I think they don't fall under the normal rules. I have always thought that if satsuki plants were available at a normal nursery or a supermarket then when in flower people would go and buy them. Just a small cutting grown in a cute way in a cute pot with some flashy flowers. That doesn't have to be expensive and it's not a bonsai that needs to be old and expensive. There is a bit of a care issue but in fact if they live or die doesn't matter that much from a business point of view, I would guess. I think many people would put them indoor and proper care is always something not everyone can or is able to supply. I think satsuki can be much more casual a hobby and enjoyed by much more people that bonsai. But right now it seems the satsuki market is a niche in the bonsai market. The belgian indica florist azalea market is actually pretty big. Cheap throw away plants mass produced and for sale at every supermarket. But nothing cute or flashy about them. Just a bush with an impressive volume of flowers that last pretty long. Even as potted flowering plants there should be a market for them. People here have many other cold tender potted plants they enjoy. Oleanders are a good example. You find them at every nursery. US is of course different because the US has many large flowering native satsuki-type azalea and it seems to me that based on the internet azalea may be more popular in general in the US than they are in Europe. As for care, they need to have well draining mix and one shouldn't really let that be dry for too long. Then you need to be careful in the harsher winters. Especially so with smaller plants in pots, though so far my smaller cold tender azalea have actually done better than the bigger ones. The eagerness of people to take care of their potted azalea usually leads to more problems when it comes to fertilizer. Plants don't die from a mineral deficiency. You will see the problem arise and can fix it easily. More often then not people damage their satsuki with fertilizer. I have even had some experienced growers tell me they damaged their satsuki when they tried something different fertilizer-wise in the quest to hope for better results. Flowers are evolved to attract insects. That's why they look the way they look. At least on the wild species. Cultivation and hybridization by humans throws a whole different twist on them. Actually, in a way the azalea evolve to appeal to humans and this survival strategy may be very successful as some azalea cultivar are propagated on a large scale. But the visual spectrum of insects is not the same as that of humans. So flowers may actually look different to insects. Also, iridescent flowers could attract certain insects. Iridescent surfaces actually change the frequency of light by being partially transparent and partially reflective to specific surfaces. Norma wrote: Thanks Russell, I can always expect knowledgeable information from you. After growing several different kinds of azalea bonsai, this dwarf is a delight. The tiny bush probably will not make a show worthy bonsai but I love the tiny leaves and hope to start some wiring after blooms fade. That site Glaucus gave you is in Northern California, Potter Valley (where my brother lives) near Ukiah (haiku spelled backwards) so there's no problem ordering from them. I checked out this website (essenceofthetree) but it doesn't appear they have azaleas now. I wonder if Glaucus' link was old or perhaps the company sells azaleas at other times of the year? Does anyone have information about this nursery? Did you email them? I can add them to the shopping basket. Some say they are out of stock but not all. 'Aozora' for example isn't. Neither is 'Chinzan'. I clicked on "Companion Plants" "azalea" then "Aozora" and took it as far as "order" with no sign of not in stock. The nursery used to be "Mountain Maples." Good people. Thanks Norma. Are you looking for something in particular? Btw, you will also see this one sold as 'rukizan' (don't know where that name came from) and 'kakuba chinzan', so don't let that throw you.